There's a whole campaign underway to bring the Forest City back to life. Here's the story of the foot soldiers in that effort—trees raised to green up our urban neighborhoods. On a summer walk through Market Square Park (directly opposite the West Side Market), you won’t immediately notice the eight small trees dotting the quaint public space between benches and park tables. Around 10 feet tall with perky branches and bushy green leaves, they blend in with the landscape and are easy to pass by without a thought. Yet these eight small trees have a mighty purpose—diligently working to eliminate air and water pollution, prevent asthma, reduce energy expenses, improve overall health and increase property values. The little trees are also part of a much larger movement: rightfully reclaiming Cleveland's "Forest City" moniker through urban forestry initiatives. Cleveland has lost almost half its trees since 1940, going from 220,000 trees to 120,000 in 2017. Those remaining trees cover a meager 19 percent of Cleveland with an additional 97 acres of canopy lost each year. (Compare that number with other Rust Belt cities like Pittsburgh and Cincinnati, which have urban tree canopies of 40 percent and 38 percent, respectively.) 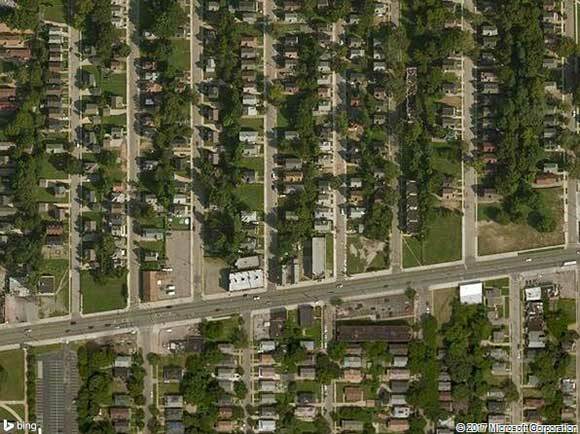 Cleveland city limits are now clearly defined on satellite images by huge swaths of asphalt and concrete, while the city’s suburban neighbors disappear underneath a plush carpet of green. But here's a breath of fresh air: the 2015 creation of the Cleveland Tree Plan provided a comprehensive study of the city’s depleted canopy, the effect it has on the urban environment and recommendations for replacing our lost trees. 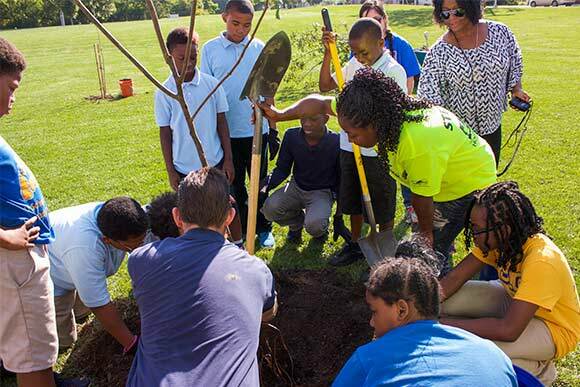 On Arbor Day 2017, Mayor Frank Jackson took the first official step in fulfilling the plan by announcing a goal of planting 50,000 trees in Cleveland by 2020 and expanding the city’s canopy from 19 percent to 30 percent by 2040. The Mayor’s ambitious goals require equally determined stakeholders. Enter the Cleveland Tree Coalition, which has been organized to fulfill the Cleveland Tree Plan and consists of more than 30 public, private and community organizations and enterprises. The City of Cleveland has further taken a major step in solving its current tree crisis by hiring foresters and arborists to advise the city on future tree plantings and help maintain the existing canopy. One key coalition member is the Western Reserve Land Conservancy, a leader in Cleveland's urban forestry since its "Reforest Our City" campaign debuted in fall 2014. Aimed at planting trees in Cleveland neighborhoods through community partnership, Reforest Our City has successfully planted 3,700 trees and distributed an additional 3,500 seedlings to area residents so far. The eight trees in Market Square Park are a microcosm of the Land Conservancy's efforts (in tandem with Ohio City Incorporated and the City of Cleveland’s forester). Though they may look like any other small group of trees, their roots run deeper than most. Trees being planted in an urban environment must survive in an unnatural habitat. Just ask Colby Sattler, the Land Conservancy's Urban Forestry & Natural Resources Project Manager. On a recent walk through the Square, Sattler noticed "a number of trees with broken branches and a snapped trunk"—vandalism that he believes was likely caused by someone stumbling late at night from one of the numerous bars on West 25th Street. “We’re trying to emulate the natural process of tree growth in an unnatural environment, and that’s incredibly difficult," says Sattler. "But it won’t deter us from what we’re doing. Selecting durable trees that can withstand city life is part of the solution." The ability to replenish Cleveland’s lost canopy hinges on selecting trees that can withstand heat, drought, traffic pollution—and the occasional over-served pedestrian. Trident maple, red buckeye, bald cypress, river birch and lacebark elm are all examples of climate-resilient tree species currently being planted in Cleveland so the city can better maintain a healthy canopy. The life of one of Market Square's hearty urban trees begins like many of our own lives: in a nursery. Perry-based Klyn Nursery is just one of numerous Lake County nurseries helping to reverse Cleveland’s decades of canopy loss. At Klyn, the process of raising a tree begins by placing a seed or tiny sapling sourced from local or Western forests into a small pot with their proprietary soil blend. 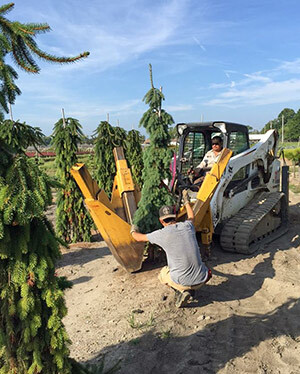 They ensure the baby tree is properly watered, fertilized and receiving adequate sunlight. As the tree grows, its pot is gradually upstaged to a larger size to maintain healthy root structure and prevent compression. The maintenance and upstaging process continues for a year or two (depending on species) before the tree is ready for planting. After the tree has been adequately nurtured, the Land Conservancy then selects a site for planting. Sites are selected based on three factors: where trees will have the greatest impact on a community, how well the trees can be maintained and where funding and staff can be effectively allocated. Central, Kinsman, Saint Clair/Superior, Buckeye/Shaker, Collinwood and Old Brooklyn neighborhoods are all priority planting locations. 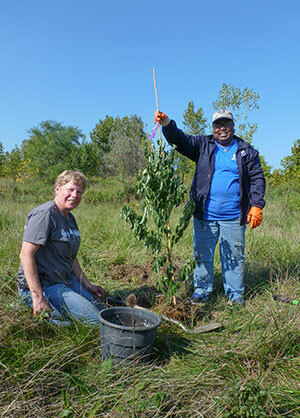 Get involved in the urban reforestation movement and help fulfill the Cleveland Tree Plan by enrolling in the Land Conservancy and Holden Forest & Garden's Tree Steward Training, which includes four free classes on how to plant and maintain trees. In any area of Cleveland, the key to a successful planting is community involvement—when neighbors take responsibility for the trees, community bonds are built and awareness about the importance of urban forestry is spread. For instance, a site with 14 percent canopy and community stakeholders who want to help will be prioritized over a location with a 35 percent tree canopy that also requires the appointment of Land Conservancy staff to maintain the trees after planting. So why does it matter so much? The positive effects of trees are felt immediately after they are planted in the ground. Even at the diminished amount of 120,000 trees, the Cleveland Tree Plan estimates those trees soak up 1.8 billion gallons of rainwater, absorb 415 tons of air pollution, save energy through shade coverage and increase property values—environmental services collectively estimated to be worth over $20 million annually. The plan also presents the direct link between higher tree canopy and lower rates of obesity, diabetes, asthma, bronchitis and hospital visits in general amongst Cleveland neighborhoods. “Underserved neighborhoods have the lowest canopies and, subsequently, the most health-related issues,” comments Sattler. Replenishing Cleveland’s urban tree canopy helps alleviate serious environmental and health issues, but under the surface—at the root level—reforesting our Forest City has the potential to unite communities through a common goal. “Neighborhood tree plantings evoke a renewed sense of community and purpose when people from all walks of life work together towards such a meaningful cause," says Sattler. "Even at Cleveland school plantings, I see kids hugging trees. Before then, they may never have thought to consider what a tree is. You’ve provided something new and different in their lives and maybe [even] created an opportunity for them down the road." Though the eight trees in Market Square Park may not be the most recognizable feature on iconic West 25th Street, the effect they have through the planting process makes them as vital to the neighborhood’s stability as the market across the street.